It Is MN Pole Competition Time! It is with a heavy heart that I will not be able to join my fellow pole sisters at the Minnesota Pole Competition this year. It would have been my third year in a row. If you have never been to a pole competition the MN is one on my favorites. The atmosphere for this competition is like no other! In years past, they have fed both competitors and guests. The announcer Sweet Pea for the competition is hilarious! She is also super fun to watch perform her burlesque routine. If you are looking to get you competition toes wet, this competition is where I would start! Since I am not able to attend, I thought that I would introduce you to the Aerial Dance MN Pole Competition Squad. The first year I went to the competition Aerial Dance had only one student competing. In the last two year that number has grown from just student to include instructors as well! I am so proud of each of my pole sisters for taking this next brave step in their pole journey! The first group of ladies I am going to introduce you to are the ladies who are competing for the first time! If I missed any ladies competing this weekend, I apologize! Please let me know if I missed you and I will get my blog updated! Here is what each competitor had to say! This is Alyssa’s first time competing! She will be competing in the Advanced Pole Sport division. She chose to compete because she wanted to challenge herself as a dancer and an athlete. One of the challenges she faced was an overuse injury from training repetitively but it helped her realize the value of active rest days. It was also difficult for Alyssa to balance working on her routine versus school or work. She would encourage dancers at any level to compete because it forces you to really hone your skills if you want to do well, which builds good habits. Training for the competition has motivated her to make more time in her schedule to practice, and to push through sessions where she is feeling weak or slippery. It’s been extremely rewarding for Alyssa to figure out that she is capable of more than she had previously thought. Hayley has never competed in pole before, but she has competed in horse shows. 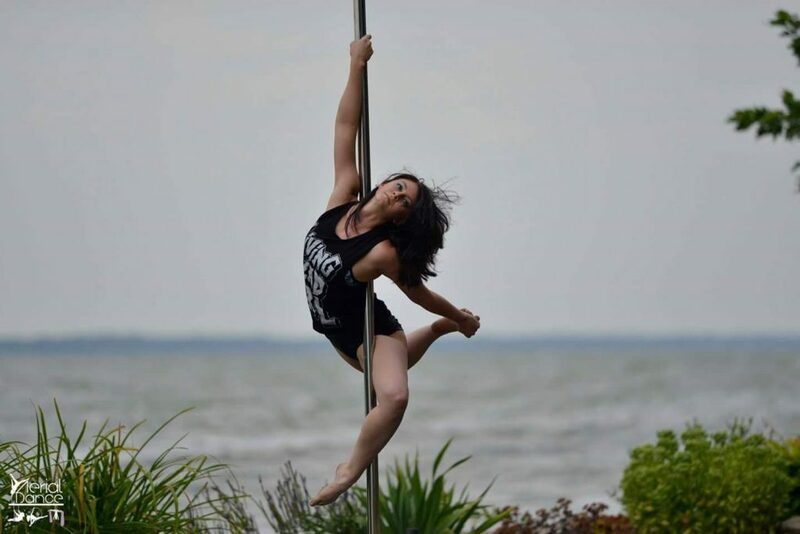 She is competing in Intermediate Pole Sport category. Her motivation comes from her drive to create something beautiful for people to watch. She wants people to enjoy themselves. A challenge Hayley faced was the planning portion of the routine. She claims she is not the greatest when it comes to deadlines, but she is incredibly organized which has really helped her through the process. Hayley would definitely encourage others to compete because it’s such a wonderful experience. Yes. it’s incredibly difficult. There were times that she questioned why she even agreed to compete in the first place. The biggest thing that helped her succeed was the atmosphere that our studio creates. It gave her the courage and will to continue doing what most people wouldn’t think of doing in a million years. Her greatest reward while training was simply the satisfaction of knowing that she created and made a wonderful piece of work for the public, but most importantly for myself. 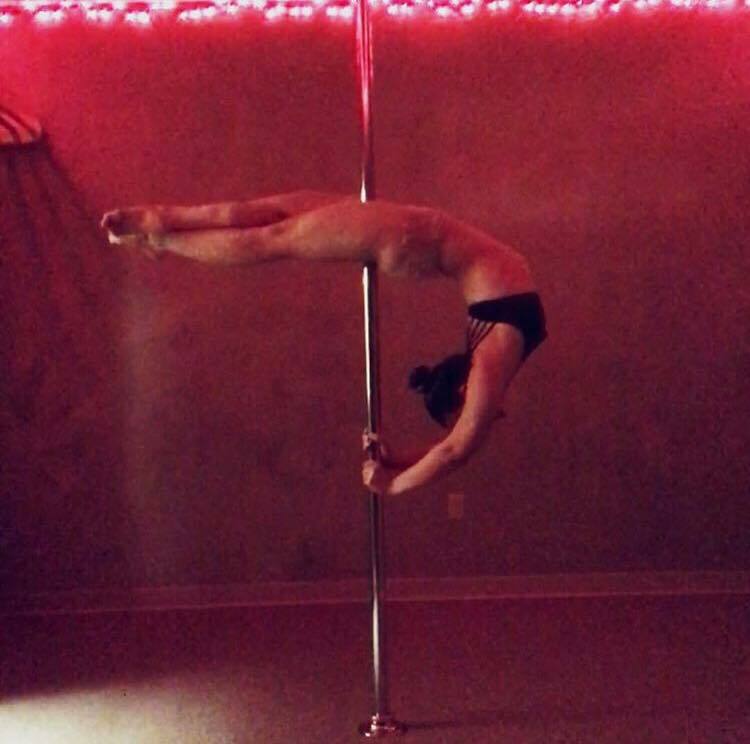 She has loved to see her pole journey grow and grow each time she learns a new trick or combo. This will be Molly’s first competition! Her category is intermediate artistic dance. She has performed in two Christmas shows and did a solo for the student showcase last year and loved it. The reason she is competing is to perform and to also express herself. Molly took several years of dance as a child and into her teenage years, but then stopped and never had the opportunity to return to dance. Aerial Dance was a way for Molly to be reintroduced to a completely new and challenging dance form. Pole gives Molly the artistic outlet that she has been missing, which is why she chose the artistic category. Molly also loves being active and pole is challenging and rewarding way to become stronger. She is not looking to be the best or to beat anyone, she is motivated by the personal challenge and being able to connect emotionally to the song and the movements. Molly feels that if she’s done that then she’s accomplished what she set out to do. The biggest challenges for Molly were learning to love herself and the journey. She often got so caught up in achieving perfection that she would forget her reason for deciding to compete. Molly feels that she is always comparing herself to others and wishing she could do what other girls are able to do. What helped her to overcome this feeling was remembering that everyone is unique and has their own strengths and weaknesses. She would definitely encourage everyone to compete. You don’t have to do it to impress an audience, do it for yourself. Whether you’re a beginner or an advanced student, everyone has a place in the pole community and everyone’s journey is important. The biggest reward Molly’s felt so far is being able to pick myself up after feeling defeated. There have been awesome practices where she nails a combo and feels invincible, and there have been practices where I feel tears welling up in my eyes because she was so frustrated. It’s all about personal development. She reminds herself of where she started and where she is now. Molly stated, “I’m so freakin’ proud of myself. I’ve never let myself feel proud before, thinking that I never deserved it!” Molly is learning to say, “look what I can do and look how awesome I am!” That is a HUGE accomplishment for her. Majestic Pole Comp Unicorns Back for More! This will be Cybil’s second time competing! It will be her first time at Minnesota and in a new category! Previously Cybil competed in dramatic category, now she is doing exotic! Cybil feels that It’s a really big accomplishment to get up on that stage by yourself. She likes the challenge it brings! One of her biggest challenges is not giving herself enough time. She registered early for competition but between life and Christmas show she did not prepare as she would have liked. Cybil would highly encourage others to compete. Some people compete for wanting to win over others, but Cybil thinks our accomplishments should be celebrated! Competing to her is like a big showcase of where my skills currently are versus actually trying to win. The competition team is always the best part of training because she gets to spend so much time with her pole sisters! Everyone is so encouraging and when we practice it’s like being with the best cheering squad ever! Plus the weekend of comp is like a giant sleepover with your best friends! Competing always seems so scary and intimidating (and she is not saying it isn’t! ), but it is really so much fun and you won’t know how it feels until you do it. The instructors and Paula help you so much to help you succeed – it isn’t a complete solo act! And don’t ever let your self-doubt hold you back. There are literally women of all skill levels, ages, sizes that are competing! Cybil’s first competition felt like a giant show case – women from other studios in my same category were backstage with me before she performed and got her excited and pumped to perform her piece! This will be Kayla’s second competition, she absolutely loved her first competition. Her previous category was level 1 dramatic. 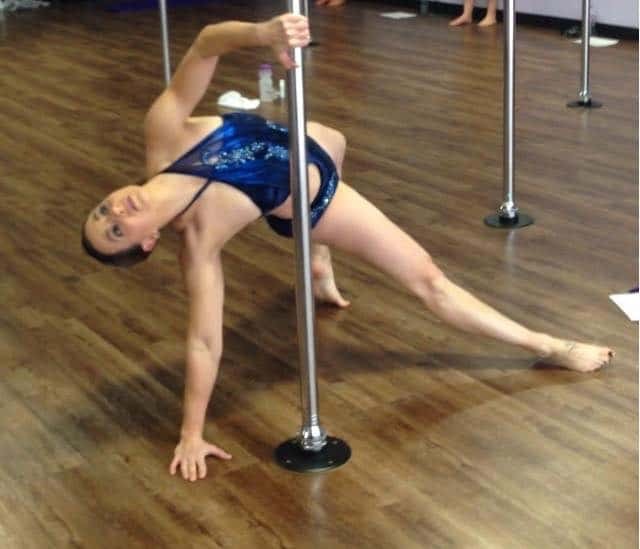 Her current category is Intermediate (level 2) pole art. Kayla loves to perform. She gets excited thinking about competitions. Competitions usually help Kayla get into better shape. The biggest challenge Kayla has overcome would be coming back after breaking her ankle in two places and strengthening it again. Also pointing that foot with out it trying to be a sickle foot… She is still working on that challenge. Kayla feels that EVERYONE should compete if they love the sport. It is soooo much fun! Not only doing a routine you love but being surrounded by your pole family! Kayla’s greatest reward while training was getting her hand stand stag. The first time she learned it, it was a challenge and now she loves it! WAY TO GO KAYLA! Natalie’s category for the MN Pole Comp is Intermediate dramatic. 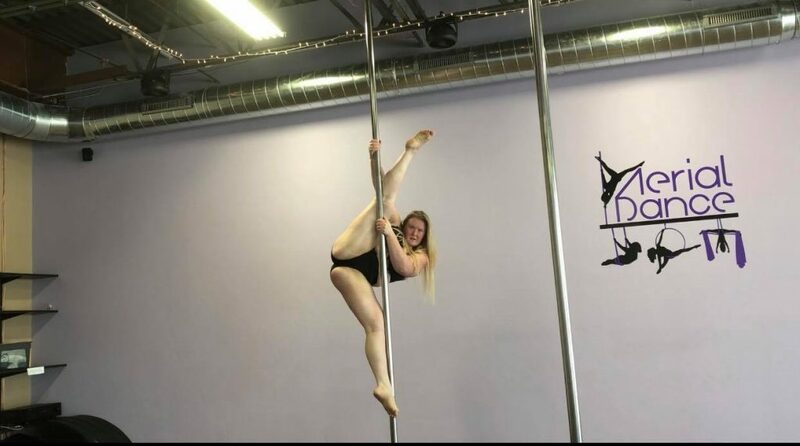 She started competing one year into starting pole dancing. To her, it sounded like a good way to express herself. She was terrified the first time getting on stage but it was exhilarating being able to show an audience what she created. She obviously enjoyed it because this will be her 4th competition! Natalie was honest with me, preparing for a competition is exhausting. But she has learned so much through every routine she has created. Natalie thinks the most challenging part for her is second guessing her routine and micro bends! Natalie would definitely recommend competing because it challenges you to be better and makes you work towards a goal. Anyone can do it. It’s fun just being able to meet different members of the pole community. Natalie feels the greatest reward for her was just getting up on stage and the feeling of being there in the moment. It’s like a whole different world. It’s a rush. For the upcoming competition she is most excited about the feeling in this routine and what it represents. Natalie is excited to show everyone what she came up with! This will be Sarah’s second time competing at Minnesota. She has also competed twice at PSO. Her first competition was 3 years ago in May. Sarah feels that one challenge is putting together a full routine and being able to actually perform it. It is a very different side of pole then just practicing tricks or short combos and feels much more like dance to her. Creating a routine also gives her a final product. This product is a complete routine that she has performed, which she personally really enjoys. The physical challenge of getting through a full routine also gives Sarah a huge sense of accomplishment, once she actually gets to that level in her training. The endurance required to get through a full routine – it is hard to build up and can seem impossible the first couple times you try to run your routine. Sarah has felt that way when she started with routines that were 2 minutes 20 seconds and she for sure feels that way now with routines that are 3-4 minutes! The mental aspect of competition is also challenging for Sarah. The training itself can get in your head and some days you don’t bring your all to your training sessions because you’re feeling discouraged or, even worse, when you feel like you’re not good enough/strong enough/flexible enough to be competing. Sarah feels that if you are okay with not winning then yes, definitely you should compete. It is a wonderful avenue to explore a different side of pole and a different side of yourself, but it is not easy and she is definitely not doing it to win. And not everyone finds competition rewarding or enjoyable – if it is only going to stress you out, or you don’t have time to commit and don’t do well if you feel unprepared, then don’t do it. If you like a challenge, like performing, like having the whole picture of a routine with baller moves and costume and makeup – join us! Also, if you want to see what it’s all about without competing yet yourself, just come to one of the competitions. Usually there are several groups of us staying at AirBnBs and then we spend the whole weekend immersed in pole – even if you’re not competing, it’s a fun time! One of biggest rewards Sarah receives from a competition is seeing what she can accomplish in the process of pushing herself harder than she otherwise would. She also has been really enjoying the camaraderie of the competition team at the studio. It’s a different aspect of the support structure that Aerial Dance has brought into her life and it’s also really fun and inspiring to see everyone else’s creations and accomplishments on their journey! 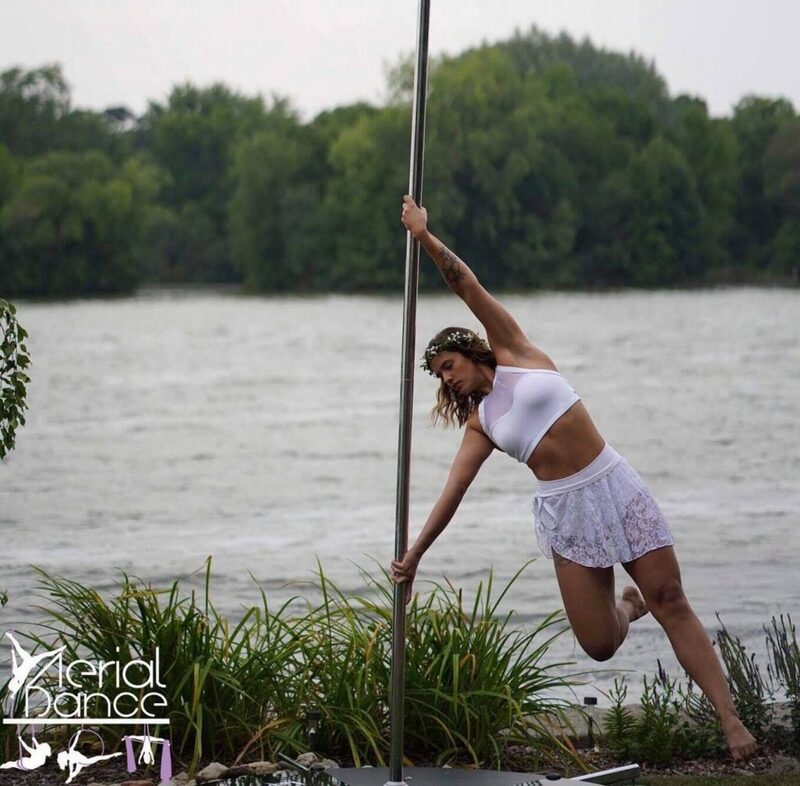 Veronica has competed before, this will be her third time competing and her second time competing at the Minnesota Pole Competition. Veronica likes to compete because she likes to perform, its something she has always loved doing. Competing also helps push her physically, by training harder, and creatively by getting her brain working to think of combinations and flow rather than just moves. She also loves working with the rest of the competition team. She likes to see what team members come up with and what pole personalities they have. One of Veronica’s biggest challenges is confidence. Especially this year, she has not felt comfortable in her routine. Trying to get out of a funk has been hard for her. She is dancing to one of her favorite songs, so she wants it to be perfect. Veronica knows competing is not for everyone, but she encourages others to try it. She would first encourage them to perform more at the various events hosted by Aerial Dance. Veronica loves seeing everyone’s creativity come out. One of the greatest rewards for Veronica would be nailing a routine for the first time after working so hard on it, its the best feeling when it just ‘clicks’! GOOD LUCK THIS WEEKEND LADIES!!!!! WE ARE SO PROUD OF YOU!!!! PreviousPrevious post:I Didn’t Even Know My Face Was DirtyNextNext post:A New Year!